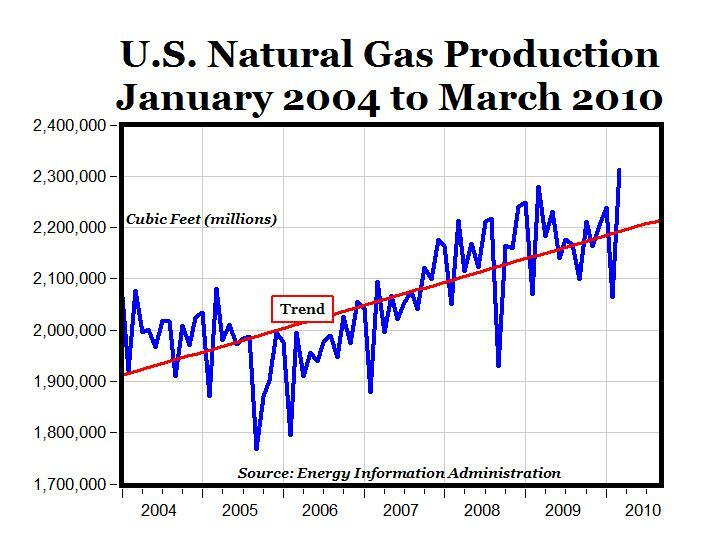 The Energy Information Administration released new data yesterday showing that natural gas production in the U.S. reached an all-time historical monthly high in March of 2.313 trillion cubic feet, breaking the previous record of 2.28 trillion cubic feet set in March of last year by almost 33 billion cubic feet (see graph). As I have reported previously, the U.S. is now the world's largest producer of natural gas, having surpassed Russia's production last year to become the new "Saudi Arabia of natural gas." It's all because of a breakthrough in drilling technology, involving the use of three-dimensional seismic imaging and hydraulic fracturing of shale rock, so that huge amounts of natural gas are being produced in New York, Pennsylvania, Texas, Louisiana and other states. In 2000, shale gas accounted for only about 1% of our natural gas supply, but now about 20% of gas comes from advanced shale drilling, and that breakthrough is responsible for boosting gas production to record high levels. The abundance of natural gas in the U.S. was completely unexpected as recently as seven years ago when Alan Greenspan in 2003 warned that shortages of natural gas could hurt the U.S. economy. We're now in a new age of natural gas because of advanced technologies, and it's going to be a real game-changer. Obama, Al Gore and Left hate clean, abundant and cheap natural gas. This data makes them livid. While I've been more negative about the long-term prospect of oil, US gas production has had different fortunes as of late. Shale gas has it's skeptics: they're hesitant about it's prospects based on economics and environmental factors. Wells have a very high depletion rate after the first year, too (on the flip side, producers almost never drill dry wells). I don't work in the shale gas industry and therefore don't feel qualified to forecast it's long-term prospect. For the time being, at least on the surface, it appears that abundant sources of gas do exist. If this truly pans out, be sure to thank George P. Mitchell. Even with technological advances, the aggregate cost of energy (e.g. oil, gas, wind, solar, etc.) may rise faster than income, because of "peak oil:"
Greater expenditures on alternative energy should increase energy costs faster than income. Peak oil, "Obamanomics," and worthless regulations are a poor combination for U.S. living standards. T Boone Pickens was able to basically skip the wind power part of his plan and go straight to trying to power vehicles on natural gas. The wind was intended to free up natural gas for vehicles and lower the price. He still wants government money, but he at least isn't needing that huge power grid build out. Hey PT are you shorting oil? Juandos, when there were 100 million bison, in the Great Plains, it was easy to shoot one. Of course, it became more difficult as their populations dwindled. It's possible we can create 100 million bison instantly. However, it's more likely to be a slow process. No, I wouldn't short oil. There are a few factors that are being missed by the optimists. First, the CBM boom, which added a lot of new production over the past few years is in decline. Second, the Gulf is going to have trouble maintaining gas production because of rapid decline rates and little in the way of drilling activity over the next few months. Unless the US allows offshore drilling in Florida and California the companies will have to settle for the very expensive deep water drilling, which is not popular given the BP fiasco. Third, the shale gas players can't make money at these prices, which is why we are seeing drill rig counts begin to decline and why the shale players are selling off assets. Forth, the US is getting its production from approximately half a million wells. That is significantly more than most producing areas of the world, which means that per well productivity is very low and that the low hanging fruit has already been picked. The factors above are negative for US production looking forward. While we could see some further temporary increases they are likely to be from previous investments that are finally coming on line or the usual accounting gimmicks being played by the authorities. It would not surprise me to to find out that some of the production growth came from double counting and lousy record keeping, just as some of those job gains from the reported triple counting census workers who kept being laid off and rehired to game the numbers. Natural Gas for Europe www.naturalgasforeurope.com provides updates on developments for those interested in seeing if the Baltic Basin and other prospective European shale formations, will be the next Marcellus, Haynesville, Eagle Ford, etc. I would not get too excited about European shale plays yet. First, shale gas is not economic for the producers at anything close to current prices. Second, the EU is much more likely to have issues with the environmental impact created by the frac process. Given the population densities the Europeans are much less willing to create problems for the water tables than some American jurisdictions. Peak, I like your buffalo story. One difference, however, when compared with oil, is that the rising price of buffalo hides probably didn't result in renewed exploration, and resultant discovery of vast, hitherto unknown reserves of buffalo. We are most likely way past "peak buffalo", and no new effort or new technology will change that. The good news is, that unlike oil, we no longer have any need of buffalo. We have vast new sources of hides. As you said, we could probably build up huge reserves of buffalo over time, but why would we want to? The same will be asked about oil someday, just not in the near future. "Unless the US allows offshore drilling in Florida and California the companies will have to settle for the very expensive deep water drilling, which is not popular given the BP fiasco." That's not going to happen, no way, not for years to come. Ditto for ANWR. This tragedy will stay stained in people's minds for a long time. What should enrage people is that, while we have a national emergency going on, Obama decides he wants to spend Memorial Day Weekend in Chicago. It looks like the Democratic Party has its own version of Bush in the White House. There is little doubt that Congress will keep drillers away from the proven safer areas but I expect to see people start calling for more drilling activity once they figure out the implications of reduced production. The left can't talk about energy independence and stop drilling at the same time. I do not expect Obama to show any competence because he has none. He has to depend on the engineers at the energy companies, who have a lot more experience at actually doing something. >"What should enrage people is that, while we have a national emergency going on, Obama decides he wants to spend Memorial Day Weekend in Chicago. It looks like the Democratic Party has its own version of Bush in the White House." "I do not expect Obama to show any competence because he has none." People should not be enraged, but thankful for every minute Obama spends away from the reins of power, as that is a minute we are not being damaged as badly. The oil leak will likely be fixed sooner without his help. Say what you guys want about the Gulf tragedy: the fact is, this is America's Chernobyl. Nonsense. While Chernobyl did not do all that much damage to human beings it was still much larger than the BP spill. I also doubt that the spill will be beneficial to wildlife in the way that the creation of the Chernobyl Exclusion Zone was after the accident. While some oil eating microbes will flourish the spill will kill quite a few birds and animals so things should get worse for a while. "Nonsense. While Chernobyl did not do all that much damage to human beings it was still much larger than the BP spill. I also doubt that the spill will be beneficial to wildlife in the way that the creation of the Chernobyl Exclusion Zone was after the accident. While some oil eating microbes will flourish the spill will kill quite a few birds and animals so things should get worse for a while." I was actually talking about the impact on national morale and psyche. The Chernobyl incident left a nasty psychological scar with the Russians, just GOM tragedy will with Americans. Unless BP pulls a miracle from of its pocket in the next several weeks, it looks like the best we can hope for is the relief wells in August - and even Matt Simmons is skeptical about that. I disagree. Russians were effected badly because the myth of government competence was exposed by the accident. Americans do not suffer from a similar misconception. They know that their government is incompetent and have little trust in FEMA, the Department of the Interior, or the Obama Administration. Americans have a desire to worry about something and for now the spill is doing the job. But the worry among normal Americans is unlikely to last for all that long. If you recall, we had a similar accident in 1979 when a PEMEX well was leaking about 20,000 barrels of oil per day into the Gulf for about nine months. While some damage was done to some Texan beaches the harm was not very significant and the fish and corals did fine. I think that Americans may have other things to worry about that will trump the BP spill. The loss of more jobs, a pullback in the economy, another credit crunch, a new stimulus package, an active hurricane season, or setbacks in the Iraq and Afghan adventures are far more likely to provide a more serious issue to worry about. This issue will run its course just as the global warming concerns did and few other than the imbeciles in the media and people looking to get paid will be talking up the BP story. Strange. You disagree with me and yet and yet your spill out every reason why this is America's version of Chernobyl. As I said, it isn't. We have gone through such spills before. There are far bigger problems than BP facing us. One of them is the stupid reaction by Obama to the BP spill.